While watching one of my son’s new favorite shows, Adam Ruins Everything (an “educational comedy television series” that, sure, contains the occasional raw language, but appeals to the short tween/teen attention span), the crazily coiffed host tackled the issue of hydration. He cited multiple studies, and even brought in a hydration specialist to dispel many myths on the subject. 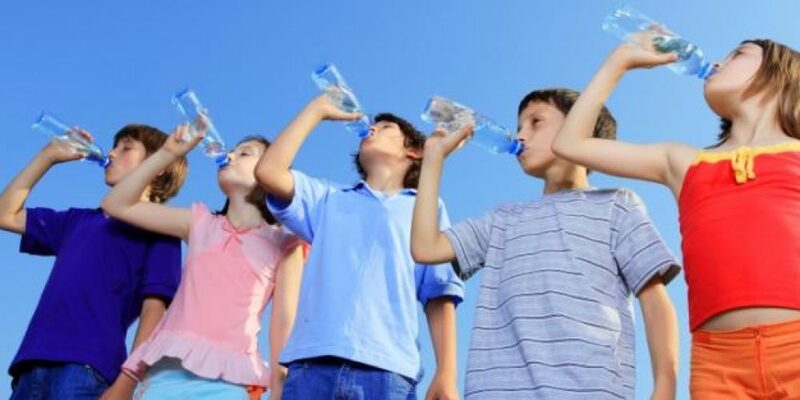 He concluded that much of the hype and fervor over fluid intake can be chalked up to marketing campaigns by bottled water and sports beverage companies. It made me question everything I thought I knew on the subject, so I decided to dig up the latest research. In an attempt to stay away from studies that were possibly funded by the aforementioned companies, I turned to the Academy of Nutrition and Dietetics, a group of over 100,000 credentialed specialists tasked with providing us with science-based food and nutrition information. They sound credible enough to me. The Academy of Nutrition and Dietetics points out that the amounts of water listed on the chart can also come from fruits and vegetables. Contrary to popular belief (or mine, anyway), vegetables often have higher water content than fruit, but seriously — are you more likely to get your kids to snack on watermelon or lettuce? Keep cool, and obey your thirst this summer!